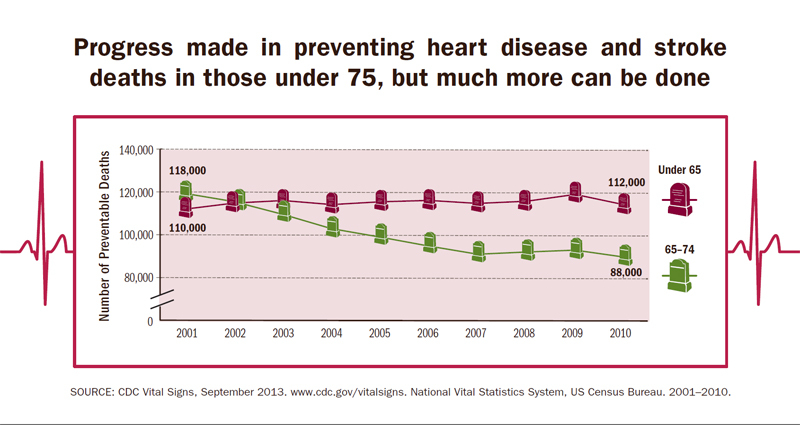 Infographic: "Progress made in preventing heart disease and stroke deaths in those under 75, but much more can be done"
To learn more about heart disease and stroke, visit http://www.cdc.gov/heartdisease and http://www.cdc.gov/stroke. For more information on high blood pressure, visit http://www.cdc.gov/bloodpressure. Visit millionhearts.hhs.gov to learn more about Million Hearts, a national initiative that aims to prevent 1 million heart attacks and strokes in the U.S. by 2017 by focusing on improving clinical care and community prevention strategies. Vital Signsis a report that appears on the first Tuesday of the month as part of the CDC journal, Morbidity and Mortality Weekly Report. The report provides the latest data and information on key health indicators. These are cancer prevention, obesity, tobacco use, motor vehicle passenger safety, prescription drug overdose, HIV/AIDS, alcohol use, health care-associated infections, cardiovascular health, teen pregnancy, food safety, and viral hepatitis.